Bwlchyrhiw is one of Wales’ oldest Baptists causes. 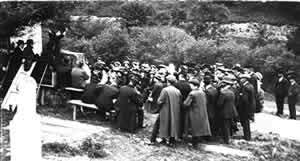 Bwlchyrhiw was founded during the dark period of oppression of nonconformists at the hands of the Stuart kings. As early as 1662 a congregation of Baptists and Congregationalists worshipped in this remote area, hidden away from the reach of the authorities. They held services in a cave on nearby Craig yr Eglwys hill. In 1688 the Congregationalists founded Crugybar Chapel, Caeo, but the Baptists remained at Bwlchyrhiw. The first chapel here was built in 1717. It was known at first as Glynyrefail, as a smithy’s workshop stood nearby, where earlier meetings had been held. 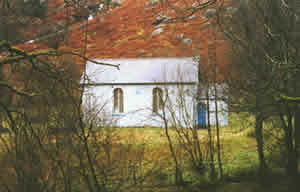 The chapel may stand on the smithy site. Evan gave up in 1737, but soon after was persuaded to return and try once more. This time he succeeded, and the Bwlchyrhiw congregation grew quickly. Bwlchyrhiw was a branch of Aberduar chapel, Llanybydder until 1817, when Bethel, Caeo and Bwlchyrhiw were formed into a new church. This church opened new branches at Capel Seion, Rhandirmwyn and Salem, near Pumpsaint. 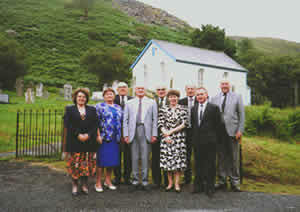 In 1833, Bwlchyrhiw and Capel Seion formed a new church, with 81 members. Throughout the centuries, the chapel has served a population of farmers and shepherds drawn from a wide area. Unlike other nonconformists, the Baptists practice baptism by full immersion, following the example of Jesus himself. It is also said that full immersion represents the burial of the convert in water and his rebirth as a new person in Christ. The baptismal pool can be seen in the stream across the road from the chapel gate. There are several interesting associations with Bwlchyrhiw. William Williams Pantycelyn was inspired to write the hymn “Cul yw’r llwybr i mi gerdded, is fy llaw mae dyfnder mawr” after travelling through the narrow valleys of the Bwlchyrhiw area. The Rev. Zachariah Thomas was one of three brothers from Tyhen, Caeo famous for their preaching talents. As a child, Zachariah saw the first baptism at Bwlchyrhiw in 1737 and later served as minister here for 59 years. He is buried here. More recently, the Rev. WJ Gruffydd, former Archdruid of the National Eisteddfod, was minister here (1972-75). The chapel was renovated in 1867 and rebuilt in 1906. In 1992, it celebrated its 275th Anniversary. 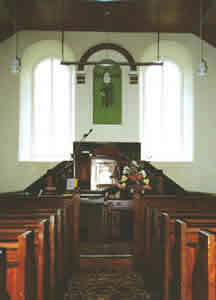 The renovation of the chapel in 2001-02 was made possible by a grant from the Heritage Lottery Fund Committee for Wales. There are monthly services held at the chapel, which are bilingual, and there is a warm welcome for anyone visiting the area, to join in with us.